Photo courtesy of Gustavus Adolphus College. 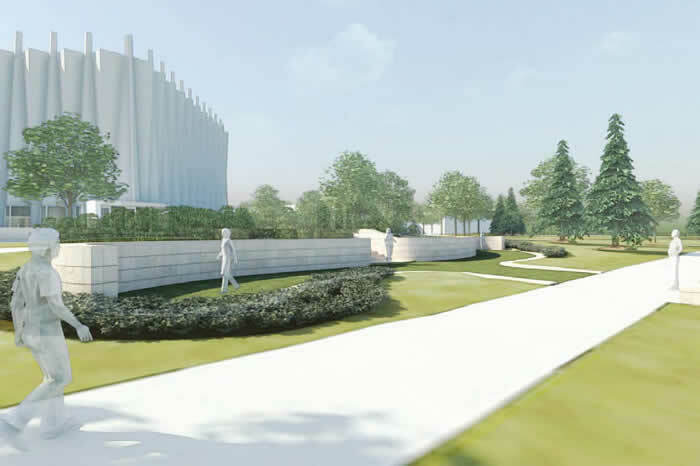 This is an architectural drawing of the memorial garden at Gustavus. Christ Chapel is in the background. The Thursday, Sept. 19 edition of The Mankato Free Press featured a front-page story on a new columbarium. 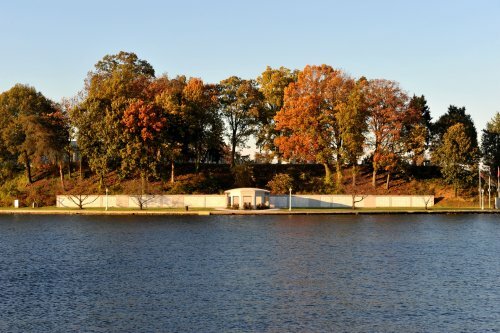 Columbaria (places where cremated remains are stored) are nothing new, dating back to the ancient Greeks and Romans. However, the columbarium featured in the newspaper article struck me as unique—it is under construction on the campus of Gustavus Adolphus College in St. Peter, Minn. I respect my alma mater (Minnesota State University-Mankato) and I currently work there, but I can’t say I would think about storing my ashes in a university columbarium. But I recognize that a small, private college can hold a special place for alumni, staff and faculty. So far five people have expressed interest in the Gustavus columbarium, even though the college isn’t taking reservations quite yet. The price will be $2,000 for one niche or $3,000 for a niche that holds cremains of two people. Even though I hadn’t heard of a college columbarium, the idea is not exactly new. A 2007 New York Times article noted the beginning of the trend—approximately six universities offered the option at that time. Photo courtesy of the U.S. Naval Academy. It has had a columbarium on site for more than 20 years. College officials point to the fact that people are not as attached to their hometowns as they used to be. They perhaps feel more connected to their alma mater than anywhere else, hence the reason for a trend that is only likely to grow. Gage Towers at MSU were imploded this summer. Perhaps that would be a fine site for the Maverick Columbarium? LOL! Would you consider being interred at your alma mater instead of a hometown cemetery? I wouldn’t do either. My ashes will be cast into the waters of Puget Sound not far from my home in Seattle. But I can see it if the connection to an Alma Mater is strong. For me, I wanted the degrees to improve my career opportunities, & then I was done with the college. I do, however, still route for the Michigan State Spartans! I agree–my alma mater has been great to me, but there are many more places I would first turn to when thinking of where to place my ashes. I guess I understand it, sort of. But would I? Probably not. But then, I always think funerals and cemeteries are for the living (as weird as that sounds). I would want the family members closest to me, who want to remember me, to decide where/how they want to do ritualize their memories. I understand it, too. I guess if you had family members interred on a campus, it would be a good excuse to stop by more often!